The project SYNMOD, funded by the European Science Foundation, proposes to apply a comprehensive synthetic biology approach to the design and production of novel antibiotic molecules. First, evolutionarily pre-determined peptide modules are precisely defined and then re-combined for novel antibiotic functions. The modules are obtained from the group of lantibiotics, post-translationally modified peptide antibiotics. Next, we will assemble a context-insensitive post-translational machinery by exploiting promiscuous modification enzymes and enabling a fine-tuning of the composition of the modification pathway. This will be obtained by organizing the pathway in a modular fashion and providing thoroughly characterized expression elements. This pathway will then be implemented in a novel production chassis of reduced complexity, specifically the Gram-positive Staphylococcus carnosus (2.56 Mg genome), and the resulting strain will be used to manufacture preparative quantities of a variety of novel lantibiotics. By consequently applying the principles of modularity and context-insensitivity on the various levels of the engineering process, we attempt to provide a antibiotic design and production system of unusual robustness and predictability. 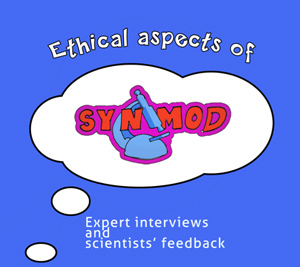 Ethics: Using this project as a concrete example, we will analyze the potential impact of synthetic biology on the safety of biotechnological processes and its ethical implications for our society. These considerations will be shared with the public to institute a constructive dialogue about a potentially transformative novel technology. We also created a teaching package containing a lesson plan, a class presentation and additional theoretical materials for teachers, a crossword, and an educational game SYNMOD, available for Android and iOS. It is aimed to teach the principles of synthetic biology and inform players about the problem of drug resistance, ways to overcome it, and novel antibiotics production. Find more infos here or download English version or German version and educational game for Android and iOS Apple devices! Funded by the Austrian Science Fund (FWF), project number I-490 B-12.